Welcome to the podcast John. Thanks for having me. No problem will appreciate having your own e-commerce marketing podcast. I know your core specialty of course is conversion rate optimization, and it's actually. Been kind of a Hot Topic on my end. We're looking to do a lot of different things on our end with Omni star affiliate software and kind of improve our conversion rate and I've been talking to a lot of people about it actually lately. So it's very timely subject because it's kind of been on my mind quite a bit, you know before we get into that and you know the tips that you can provide us. Why don't you tell us a little bit about your background and how you got into what you're doing today? I've been running the good for about 10 years now. It will be 10 years coming up here in April and we originally started as a e-commerce development shop. We worked with mainly e-commerce Brands helping them build out e-comm website. You know what we found was that? It became a bit of a commodity right so development in that sense really became where anybody could build a website on most platforms these days and have a pretty good outcome and our clients really didn't care that much about how the code quality was. They just wanted a functioning. But really what we found was that Brands really enjoyed working with us and chose the good because we always baked in at least 3 months of optimization of their site after we launched it what that meant was we would go in and do a/b testing and help make sure analytics were appropriate and once I realized that that was the really where customers wanted to work with us. We pretty quickly understood. That that's what we should be focusing on so about 6 years ago or so, we turn to exclusively focusing on conversion rate optimization and helping Brands convert more of their existing website traffic into customers great. Great. Yeah, that's some I mean you're in a very popular Niche these days and it like you mentioned the early days of the internet really wasn't much emphasis on you know conversion rate optimization as you as you mentioned, you know when things kind of first started off. Companies were just glad to be online, you know, they're good to have a glad to have a presence in so, you know likely the intricacies of optimizing your site Optimizer the conversions and the conversion rate was a really in the Forefront of people's minds but now it's a it's a different story because you know, everybody's alive about has a presence, you know, people know how to go through different channels to get traffic coming whether it's organic traffic whether it's through all your other types of marketing or whether it's to pay. Quickmark advertising and marketing the main battle that we all have at least all e-commerce. Businesses have is trying to convert all of those visitors and the stat that you have when you're on the homepage of your guys site really just speaks volumes to the issue, which is 98% of of website visitors won't buy from you today, which is astounding when I first heard that stat, I'm like, wow, you know 98% of the you know, that's that's huge amount. And so you don't you just gotta wonder what can be done to combat that and how can we as an individual business? Improve that conversion rates. So before we kind of get heavy into a want, can you please explain what conversion rate optimization is for those that aren't familiar with the terminology and why is it more important than ever these days? Well, that's a great question Ireland conversion optimization is really formed based in data science. It's all about tracking every click and movement that people take on your site and using that data to understand where the challenges are. It helps you to understand what content is engaging and not engaging where people are dropping off in the funnel and why? In conversion optimization is really comes down to helping consumers to accomplish the two tasks that they're your site to do. The first is to understand if your product or service can help solve their pain or need. And if they determine that it can they want to be able to convert they want to purchase that product or service as quickly and easily as possible. So really it's all about making sure your site can help solve those two pain points and then getting out of the way and so conversion optimization is all about understanding how you can let consumer data the clicks and movements that people are taking on your site influence your decision. And use that data to make data back decisions about what improvements should be made to your site. Right? One of the things though that I kind of been struggling with as of late is I've been dealing with a lot of Niche companies, you know here at Omni star. We have a lot of businesses e-commerce businesses that use our software selling how kind of a whole host of different things. I mean you name it. I've seen it just really really interesting products and you know, so they really in dealing with specific. Demographics and what I've been seeing lately and I don't know if this is just the fault of the business or just want to kind of get your take on it actually, but what I've seen is that some of these Niche businesses that have a specific products or services? I don't know if it's because that they know that they're communicating to a specific demographic that knows exactly what it is that they're providing or they just are having trouble communicating their messages because I've seen gone to a lot of websites where I'm looking at their home page and I'm trying to figure out okay, what do they do? I can't really get a handle on it and Services I go to the about us and I still can't make heads or tails of what the product is. And so I wanted to get your take on. That is it? If you really are dealing with the specific demographic and let's say you're not really doing a whole lot of broad marketing, you know exactly who you're targeting. You're not worried about just anybody coming to your site. Does it really matter with regards to the your messaging and trying to make it? Clear statement on do. Well, I think first of all that we see this challenge even on well-known Brands. The problem here is that it's really hard. I like to say this often. It's really hard to read the label from inside the jar. Meaning that as a brand you are the ones who know your product line, you know your service, you know what message you're trying to communicate but none of those things really matter to a first-time visitor to your site. They're just trying to understand if you can help them with their pain points and their needs like I spoke about earlier, you know, you really need to focus it around what their pain points. Are you mentioned earlier on our website here at the good the first thing you see is that 98% of your website visitors aren't going to. Today, well that's speaking very clearly to a specific audience right e-comm brands that are looking to improve their conversion rates. They want to be better than that average or improve on on where they're at currently. And I think that that's important you want to speak to the pain points of the visitor who matches your ideal customer profile that comes to your site, but you also need to understand that it needs to be based on what the consumers actions are what they're trying to accomplish as opposed to just trying to communicate a marketing message. We worked with Easton baseball. Ninety-nine percent of college swings are done with their baseball bat and they really own the Little League like Little League World Series Etc. When we first start working with them, we found that the biggest challenge that consumers had was knowledge. He's in their bats, but you go to their product category page and it would just be a wall of bats. If you can imagine all these small pictures of baseball bats. They all look the same thing, right and you can't really do. Yeah, very little differences in a picture between them. So what they were trying to do. Was differentiate based on the technologies that they had. Well, the problem was all the different Technologies. They gave marketing names, too. They came up and trademark, you know specific names to Market these products, you know, I peed intellectual property that they had and what made them different. The problem was consumers the moms and dads who were buying this for their kid in Little League had no idea what those words meant. All they cared about was what the benefit of that was. And so it made it really hard for consumers coming to the website to truly understand what bat was best for their needs and they were get frustrated and leave again. They had a pain point. They needed to get a baseball bat for their child in little league and they didn't know they were approached with a wall of 300 bats on the category page didn't know which one to choose. So what we did is came in and said Okay, first step. We need to instead say very clearly what the benefit of this thing is. And so for instance they came up with one name and I can't remember what it was now, but made no sense of the time what it did is it actually reduced the sting of the bat when you hit the ball, so it didn't hurt to really hit a home run or anything as much as it might with some aluminum bats. And you know, what we did is we went in and said, okay, let's just say that. And let people sort by less staying for instance. And that really kind of brought it back home that led us to then doing a bat finder where it was very clear what type of bat you're looking for. So what was the, you know, we did research understand what questions that the parents had and they could easily answer. So it was what type of hitter is your childhood? They swinging for the fences that are likely to bunt the ball or they're trying to get on base a base and then it. As you know, what league are they planning in because certain bats are only certified for some leagues and we found that a lot of parents were buying it bat showing up to game and the Umpire wouldn't let their kids swing with that bat because it wasn't certified for that league. So there were a whole bunch of challenges. We kept finding that was making it really difficult for consumers to do that first step, which is understand if the product is service is going to solve their pain or need and so we help clean all that up, but the bat finder it. It's and then before, you know it we had their revenue up online over, you know, two hundred forty percent year-over-year. And so just bringing that consumer perspective into the process and that was without running any a/b testing right? We had even started running A/B Testing yet just bringing that consumer process in and understanding where in the process people were dropping off and asking a few key questions and then focusing on those two tasks the consumers are looking to do just help immediately. Well more than double their online revenues. Well, yeah, that's that's awesome. And it's really just kind of a testament. 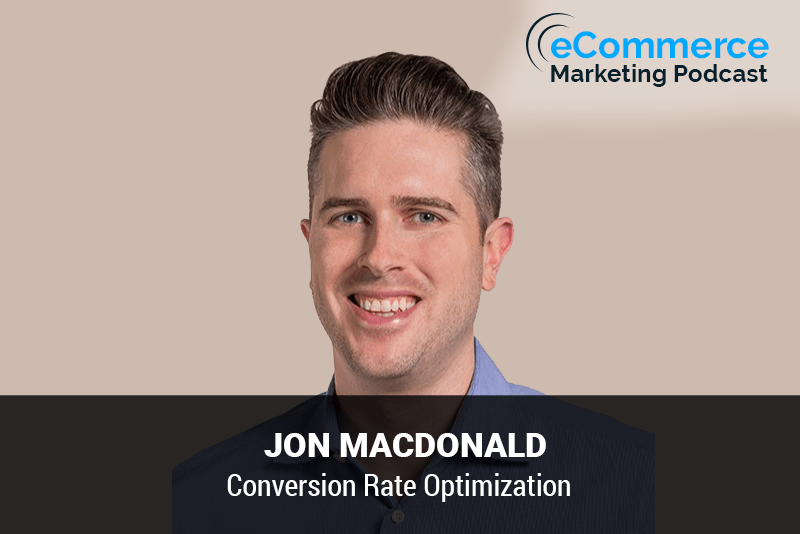 The power of of conversion rate optimization, you know, one of the things that you mention is, I think a trap that many business owners fall into it and businesses. You know try to do is when they're putting out their products or Services there as a business owner as a person is in charge of putting out the marketing verbiage on the site your kind of quick to just kind of put out there all of the features. It can do this this this and this and you know, you took cited to you know, put all the bells and whistles out there, but we don't really think of the shoe in the shoes of the consumer as to our right. Is this really? Communicating how we can solve their problem. How is it benefiting them and that that example that you mentioned from the back company, you know, really really hit home because when you said, This Bat will have less sting when you say less thing, I mean that that brought back memories of when I was in high school and playing softball during my life my death my gym p and I do remember I'm there was some aluminum bats and then you know, these are just some cheap high school writing phys-ed bats and so I. Hitting it and I can remember that was really uncomfortable. It was really I'm like man and my I was thinking I was doing something wrong but it rapidly actually writes a cheap bat and so well and you so you can relate to that right and that's what it's all about is making it relatable to the consumer who's coming to the site as opposed to the internal marketing team exactly. So that's really huge and just making sure that you really. Understanding what are the needs of the customer you're and really first off determining who that customer is and coming up with her Persona on your end and figure out how you can meet their needs now, you know kind of want you weave, of course. How important conversion rate optimization is and I think everyone can agree to that the main question that most businesses that are listening or marketing professionals that are listening is okay. All right, where do I begin and can I can all of this be done in-house do I need to hire an expert? And if so, you know what really are the differences in these approaches? The ultimate goal should be to be of the size and have the resources to do it in-house and even though we what we do is we help Brands to essentially Outsource their cro services to the good but our goal really is to instill a culture of optimization at all of our clients and a culture of testing and I would can decide they want to bring that in-house. That's great. That means they have the executive sponsorship and and the team is really focused on optimization now to the point where they know that they need this in-house that it's important. It's going to drive return on investment for them. And so, you know having that level of understanding and support from the executive team is just really important. So I'm okay of companies bring that in-house and I think that that's important now, We can obviously I mean I mentioned 240 percent growth for Easton and there's several more up on our website like that conversion optimization works and but the reason we exist is because there's a ton of those mid-market and even some Enterprise Brands you mentioned in the introduction for me. Since I have somebody who does this for a living and has a very specialized team, you know, we have data scientist PhD in Psychology and specific developers that know how to do tests and strategist and know how to build test. You know, we have a team specifically formed here around conversion optimization and when companies work with us, they're getting access to that maybe. They would be able to hire to run that program for them. The second thing is a lot of times even some of those bigger brands are looking just to get a third party perspective. Right? So there you know of the point where they are doing their own in-house testing, you know, we work with Adobe and The Economist and both of those companies have in-house testing teams that we come in and augment. Some meaning that they'll say hey, we want to run these testing but we think we might be too close to this. What do you think about that or can you take a fresh look at this data and come up with some testing ideas and that can be really valuable. Yeah, that is so true. I mean I can see both both sides of it, you know looking at the small end of things a business that. You know may not have the funds or the budget to Outsource it, you know, just looking at the small things that they can do. Like you said just communicating the benefits to the products can make a huge difference or the benefits to their services is really something that's used. So yeah, I think it just really depends on the company the size of the company and then kind of where you stand initially how bad is the problem and can you afford to invest in and having a company just really kind of go. In design overhaul, everything is it was it is it that bad or these can things that can be done in house and maybe even incrementally as far as we talked about the beginning you mentioned the specific conversion rate of the of the East and Company the back company where there was a huge Improvement as far as their conversion rate was improved now. Is there a specific conversion rate that e-commerce businesses should try to strive for well, I get asked this question several times a day and. And what I can tell you is that there's no single conversion rate that somebody should be trying to reach their people who are saying no average conversion rate is X or four different Industries. It's y or you should really strive for Z. The problem with that is that it doesn't help you improve your own conversion rate. So I always say the best conversion rate that you should be striving for is one that is always improving and that really is what matters. There is not one thing you're going to do to your site that's going to double your conversion rates overnight. If you want to do that just severely discount your products, right and but that you keep in mind that's not conversion optimization. That's just that's just margin drains, right? That's just chilling your margins, but you know, I think that the idea. Really be thinking about conversion optimization is an iterative approach looking for compounding growth over time very much like a retirement savings account, right? You're putting a little bit in every paycheck and that continues to grow that balance, but it's also earning interest in continuing to reinvest and continuing to grow over time. It's the exact same approach for conversion optimization. We like to focus on the biggest impact areas first take care of those situations. Then start looking at what are the little areas are people getting tripped up and start solving each of those over time and on a monthly cycle just attack each of these areas and keep learning and growing and reinvesting that you'll see some massive growth over time to gradient it some awesome advice actually one of the things that I see that I think businesses could encounter when they kind of start this. Kind of the battles of conversion rate optimization if you will is yeah, you know, they get on the road to optimizing some things and. I guess the question is really can too much optimization be a bad thing. Like can you make end up making too many changes too many tweaks with the efforts of really just trying to pull in these customers on the site. Could you be doing more harm than good. I mean is that is there such a thing and what's your experience? How does a business know when to stop I'll start by saying that most brands work with us for about a year? Right. So at that point what we do we often find is that we have optimized down to such a small level that we could run some tests and. And that aren't getting as much conversions and let those run for you know, three four months and collect data and then pop back in and say, okay. Let's look at these data results together. And where should we attack next and then move to something like a quarterly basis perhaps but is too much about thing. Can you overdo it? The short answer is going to be no look the inner pain. What is changing once you optimize for desktop? You should be looking at mobile and then you know, they do you have an app that needs optimized and then you pretty much look at different things. Like your email campaigns could be optimized and you can keep going from there. The reality is is that a lot of Brands come to us and say Hey I want to do. In depth personalization. Well, the challenges is I look at that kind of like a graduate level course and most brands that are protests are still in high school. They're not even doing data collection appropriately. They don't have right. So then if you're not collecting the right data in aggregate, right, so you're not having any privacy or GDP our concerns, but if you're not collecting heat maps that are click Maps or you're not you don't have the right data going into your analytics package or you're not even doing any A/B testing. You really need to start there. And once you graduate from that into really having a solid testing program and again that culture of testing built internally, then you can move on to something that's a little more advanced like personalization people try to skip some of these steps and that's really where you start to have challenges. But the thing about optimization is get in up start doing something today tracking the right data for instance, etcetera. Then you can start looking at doing something more advanced and that could take years to get to that point. So. I really don't know if there's such thing as a timeline for optimization that would end up putting the end date on that. I do think that working with a third party like the good, you know, we typically strive to help Brands to bring that internal and then us advise them as needed instead of us running all of their testing programs. And that's really where we see a shift. So that's when Brands would typically know how when to move. LT Burns should ever stop optimizing because you're going to get left behind aren't you? Got you? Yeah, that's some that's some great advice and I see Yeah, you mentioned so many different areas that a business can optimize not only the site. Their mobile experience email campaigns and you know list goes on and on and you know, you can just keep going. So yeah great great advice. Well John you definitely appreciate having you here on the e-commerce marketing podcast has been some really insightful information that is given us a call all a lot to think about our respective businesses or the businesses that we. Are working to talk to Mark it what I would like to leave our audience with his one final question. I've been asking lately could be off topic or it could be on topic depends on the work with things. But what's one thing our audience would be surprised to know about you. Let's see that when I was younger I competed on the US Olympic team for tae Kwang. No, well, okay the gold and of silver and the Junior Olympic team, so. That's something that I don't talk about much these days. I didn't transitioned into playing basketball played in college. I'm actually six foot seven. Okay, so can't that doesn't come across in a podcast very well something that I think a lot of people when they first meet me in person at a conference or see me speak. There are often surprised. They've heard me on podcast or right. I've read a bunch of my writing that's up on the good.com and then meet me in person and they're always shocked at how tall I am is false. Okay, gotcha. Yeah. You're wrong the death toll in me. I met six to so yeah, I think I don't know. You know when you hear somebody audibly, you know, you try to Envision someone. Well, yeah, like you said height doesn't come through but yeah cuando is really cool. I've always been kind of martial arts. Although I never really. Pursued one but I've always kind of admired people that do a martial arts from afar because it's a takes a lot of discipline and a lot of training a lot of practice. Yeah. Definitely. It was it was a great upbringing I enjoyed it a lot. Okay. Awesome. Well, thanks for sharing that John. Once again, we thank you for being on the e-commerce marketing podcast. Now if our listeners want to get ahold of you, what's the best way for them to contact you? Well the best way to learn more about the good and to get ahold of me is to go to the good.com. That's just th e g Ood.com and sign up for our email list. It is a weekly insight email that we send out there's about a hundred thousand e-commerce professionals on that list to be in good company. It's not a sales pitch. It's always just. Materials about what we're seeing and learning and what we're doing here at the good and feel free to email me. If you would like to get in touch. I try to read every email but I can just be reached John at the good.com. And that's Jo n at the good.com. There's no H and John. Well, thanks again for sharing that I'm sure our listeners will take advantage of that email list. Sounds like you guys provide a whole host of. Information about the conversion rate optimization. So well, yeah. Once again, thank you for being on the e-commerce marketing podcast has been a pleasure talking to you John great. Thanks for having me. I really appreciate it. Thank you for listening to the e-commerce marketing podcast. You need to get more feedback and reviews from your customers and improve your customer retention. We have made it easy to do all of this with our Advanced customer feedback. Just visit get OS i.com forward slash feedback and sign up for a free trial today. That's get OSI.com forward slash feedback.